Europe 1942. These are desperate hours for Allied forces as the Nazi war machine rages across a devastated European landscape. You are US Army Lieutenant William Holt, hand-picked by William "Wild Bill" Donovan to be the first field agent of the newly formed Office of Strategic Services-the OSS. 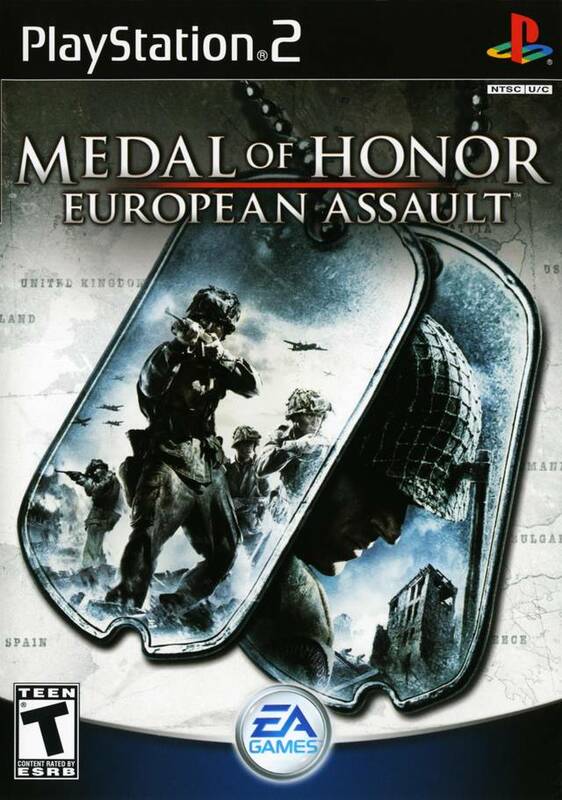 Medal of Honor European Assault makes you the driving force in the struggle to liberate Europe. Your choices shape your experience as you navigate an open battlefield - forge your own path through the war. game and every thing that came with it is in grat shaeyp game works too . vary happy with this game brings back some memerys from wen I had this game back in the day wen it wos new . 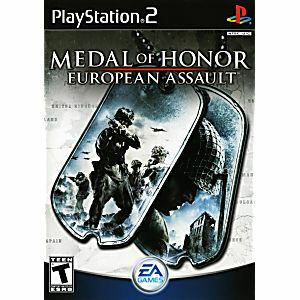 This is in my opinion the best MOH on console not nearly as good as Allied Assualt on PC but still great for a console game. The only complaint I have is the last level can be sorta frustrating but other than that it's great. 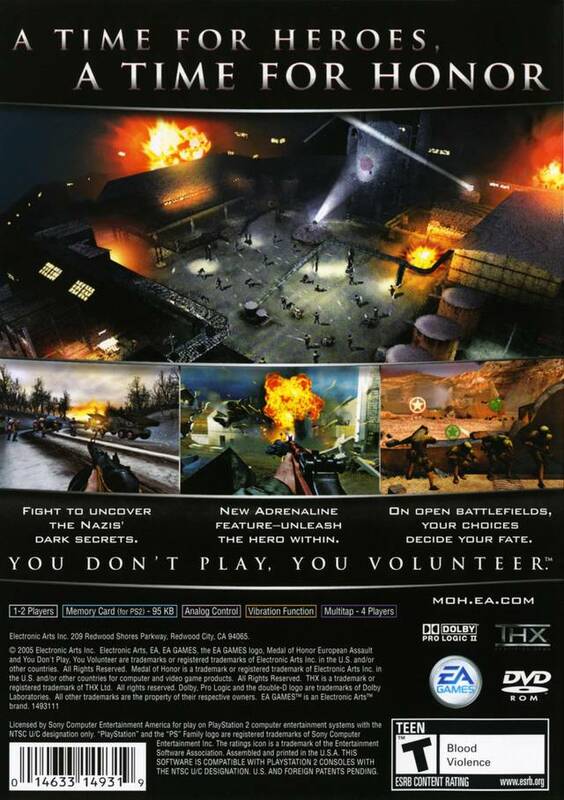 This has got to be one of the best FPS games to come out of the PS2 era. With the obvious setting of Europe in the 1940s, you are tasked with taking down Nazi Germany one man at a time. The gameplay itself is interesting, as there are some features here you will not find in modern FPS games. In this game, you are given a single primary objective with secondaries added on. You can choose to not complete the secondaries, but some will hinder your progress in the mission if not taken care of. Another feature that is seemingly lost now in modern day FPSs is the medkit systems. There is no hiding behind a wall and waiting for the blood red screen to go away, you either heal or deal with it. There is also a revive system that will bring your health back to 50% if you die in battle, but you have a limited number. The only way to get more revives is to complete secondary objectives; this is more of an incentive to complete them. This is not a game where you can run up to the enemy, say hi, and then put a bullet through them. Running directly towards a small group of enemies will likely result in less than 50% health and a feeling of regret. Another feature is the squad system. Men that fight alongside you through the mission. It is also your job to (try) make sure they do not die. You can order your squad to advance or hold a position with a simple marker. They do not just sit there like deadbeats either, they will actively shoot enemies and respond to grenades. One downside to this feature is that in some missions your squad members tend to randomly die (seemingly) and that effects your next mission. For every squad member that survives, you are awarded one medkit for the next mission. (Three surviving members = 3 medkits) The last couple of features that should be addressed are the "bosses" for each level and AI. Each "boss" is a German officer that usually has sensitive documents that you need to get (not required but still a good idea to get them). These "Nemesis" soldiers are essentially just more difficult AI with more powerful weapons than a standard enemy. Killing them is also a secondary objective, but usually you have to kill them in order to advance in the mission. I stated before that running into enemies basically seals a death warrant if you aren't accurate. That's because the enemy AI is pretty aggressive and responsive to your presence. Overall, a great FPS game in the WW2 genre that is worth a shot. Completely satisfied with the results I got from ordering two items from your company, Lukie games. I will certainly use Lukie games again if I need any games or equipment. Hi so far I enjoyed all your games. The condition of each game works like new. I will be buying more in the near future. Great games at great prices and fast shipping.